The Parthenon Music Hall first opened in 1840s as the Royal Parthenon Assembly Rooms. The Hall was used for all kinds of events and entertainment right from the start but in 1847 an advertisement for the Hall announced that its new proprietor, Mr. John. 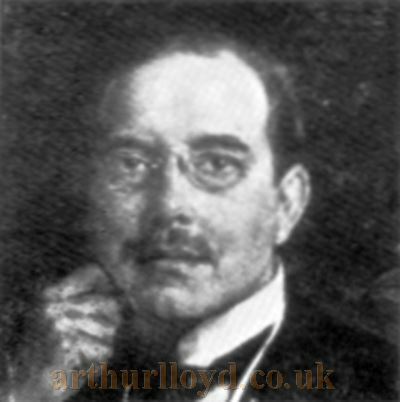 G. Stoll, who would later become the Stepfather of Oswald Stoll, had 'an unrivalled company of dancing and vocal talent' and that such were 'nightly engaged.' Entrance to the Parthenon was free and the entertainment and costs were paid for by the price of drinks and refreshment. The Parthenon had various changes of name over the years, the Parthenon Music Saloon when J. G. Stoll took over, later the Parthenon Rooms, and later still, the Parthenon Music Hall after J. G. Stoll's death in 1880. Adelaide Stoll, who had only recently married J. G. Stoll after moving to the UK after the death of her first husband, then took over the Hall along with her son Oswald Stoll who was just 14 at the time. Oswald, whose real name was Oswald Gray, started out by helping the actors backstage but his career in Theatre soon blossomed. Right - Sir Oswald Stoll - From the Moss Empires Jubilee Brochure of 1949. On the 24th of June 1886 Oswald and his mother bought the Lease of Levino's Museum of Varieties in Cardiff, along with some adjoining properties, and by the end of September 1889 they had reopened the building as a Music Hall with a newly granted music and dancing Licence, under its new name of The Empire Palace of Varieties. By 1892 the Stolls had added the Philharmonic in Cardiff, the Newport Empire, and the Swansea Empire to their portfolio, and they then put up for sale the Lease of the Liverpool Parthenon to concentrate on their other projects. This early career in Music Hall, and especially his training at the Parthenon, had led Oswald Stoll to become, first an agent, and soon, to own and manage a vast empire of Theatres and Music Halls throughout the Country. The rest, as they say, is history. After the Stolls left, the Parthenon was taken over by George Atkinson and by the 1890s it had been taken over by a syndicate whose Managing Director was Captain W. Slater, his Manager, Edwin W. Smith, later took over as proprietor. In 1904 the Music Hall was reconstructed and enlarged but just two years later Smith left to take over the Haymarket Music Hall in Beau street, and the Parthenon was closed down. However, it reopened on the 20th of November 1906 with 'Moving Pictures' and a 'Vaudeville Company'. But by the following week the Vaudeville Company had been replaced by just the Moving Pictures. Later renamed the Theatre Moderne the Theatre went on to show mostly films, but with two singers engaged in case the projector broke down. This was short lived however, and by 1908 the building was sold to Henochsberg and Ellis who converted it into a clothing store. It later became a cafe called Reece's which continued throughout the 1930s, but the building was destroyed by enemy action during the war in 1940 and that was the end for Liverpool's Parthenon Hall.